After an 11 hour day in the middle of a difficult week, instead of staying on the highway, when you live in rural Iowa, you can take the gravel roads home, maybe even some dirt roads too, if they aren't too muddy. 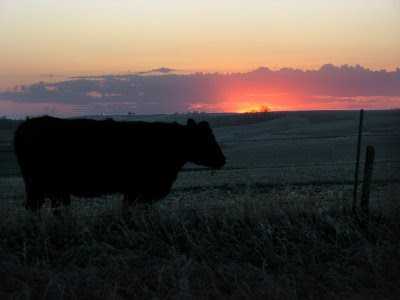 Nothing like a sunset on the prairie to soothe the nerves and quiet your mind. Once again, eat your hearts out, prisoners of city and suburb!